Hello again! 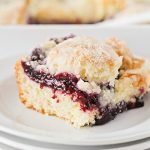 It’s Alicia from The Baker Upstairs, and I’m back with another sweet dessert recipe to share with you. 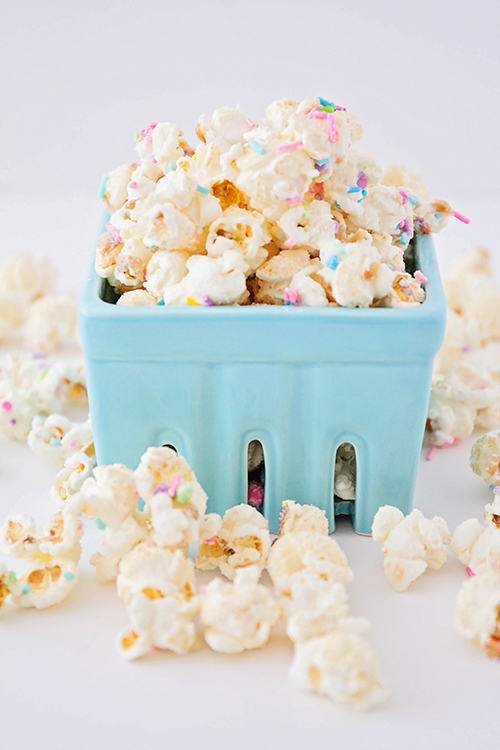 This birthday cake popcorn is not only totally delicious and addicting, it’s also incredibly easy to make! Is it just me, or does it seem like spring is birthday season? I know people have birthdays all through the year, but during the spring and early summer, it seems like my kids are invited to a birthday party nearly every weekend. I’m usually pretty good at maintaining a stash of fun birthday gifts that are age appropriate and easy to grab when we’re heading out the door to a party. Some of our favorite gifts to give are bubbles and chalk for playing outside, a sketch pad and colored pencils, or a small craft or building kit. I love having a little stash on hand so we’re never caught off guard. This week, my kids had a total of three different birthday parties on the docket, and I realized (with only an hour to go before the last party) that I had nothing left in the house to give. I was racking my brain trying to think of something fun that the birthday girl would enjoy, and I remembered this recipe for birthday cake popcorn. 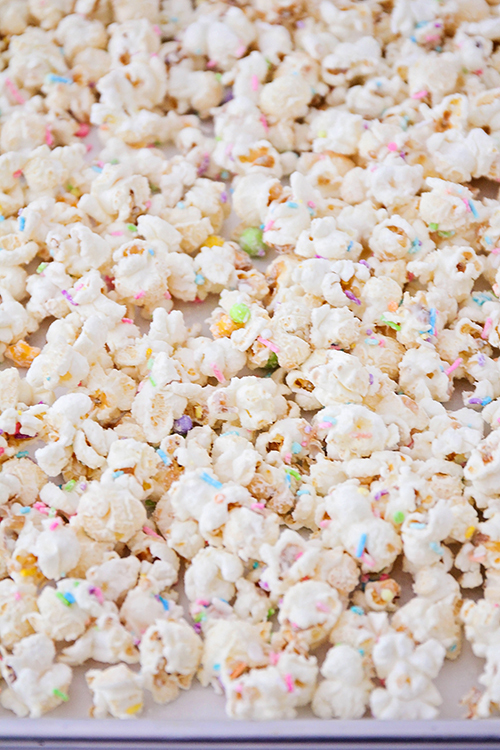 What kid doesn’t love popcorn and sprinkles? I whipped up a quick batch of popcorn, packaged it nicely, and added a cute notebook and a few gel pens for good measure. Problem solved! The birthday girl was delighted, and I got to munch on the leftover popcorn, so it all worked out great for everyone involved. Seriously, just four ingredients! It doesn’t get easier than that. I used popcorn that I popped on the stovetop (you can find a fantastic recipe for stovetop popcorn here), but you could also use air-popped popcorn or plain microwave popcorn. You’ll want to leave out the salt (or just add a small pinch). Melt the almond bark according to the package directions, then pour it over the popcorn. Toss the popcorn gently until it’s coated evenly with the chocolate. I’ve found it easiest to toss it with my hands, but you can use a wooden spoon if you don’t want to get too messy. 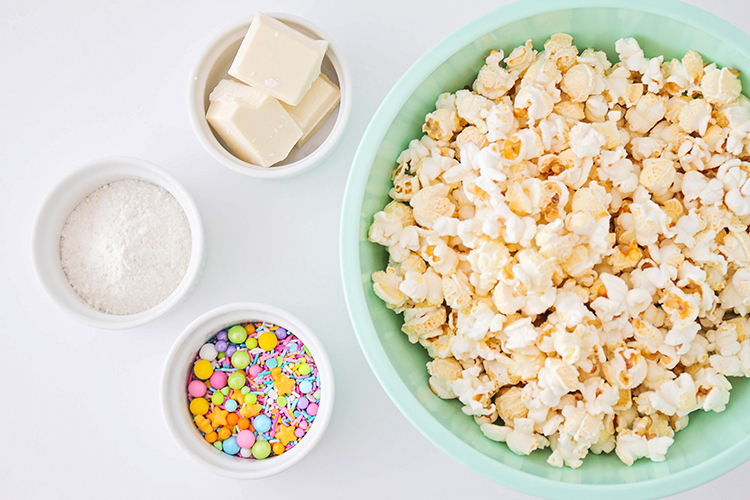 Next, sprinkle the cake mix and sprinkles over the popcorn, and toss to combine. I used a sprinkle mix from Sweetapolita that had lots of fun shapes and colors, but any sprinkles you like will work. 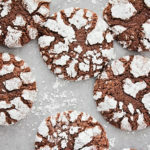 Once everything is tossed together, spread it out on a cookie sheet to cool and harden. Depending on the temperature in your kitchen, it should harden within about 10-15 minutes, and then you can package it up or start munching! When I’m giving it as a gift, I like to package the popcorn in a cellophane bag, tie it with a pretty ribbon, and add a cute label. It looks so fun and festive, and it’s the perfect birthday treat! 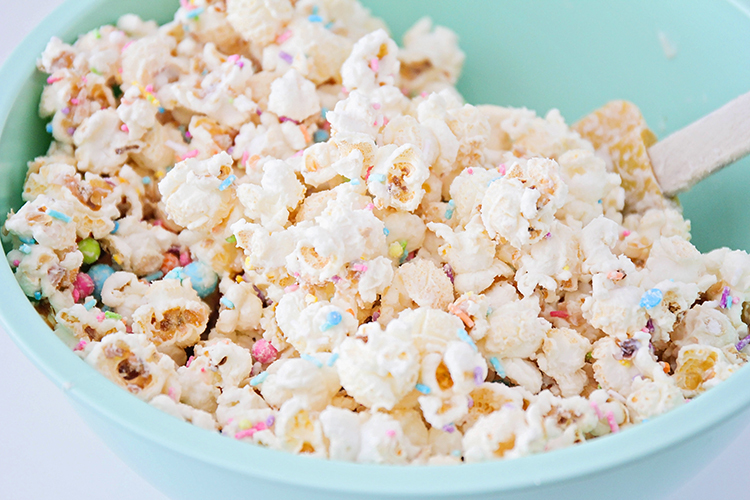 The combination of white chocolate and cake mix gives this popcorn the perfect birthday cake flavor. 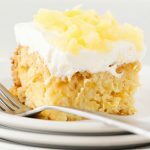 It’s sweet without being overwhelming, and the sprinkles add a fun little crunch. It’s so delicious that it’s sure to disappear quickly! In a small microwave safe bowl, melt the almond bark according to the package directions. Pour the almond bark over the popcorn and toss gently until coated evenly. 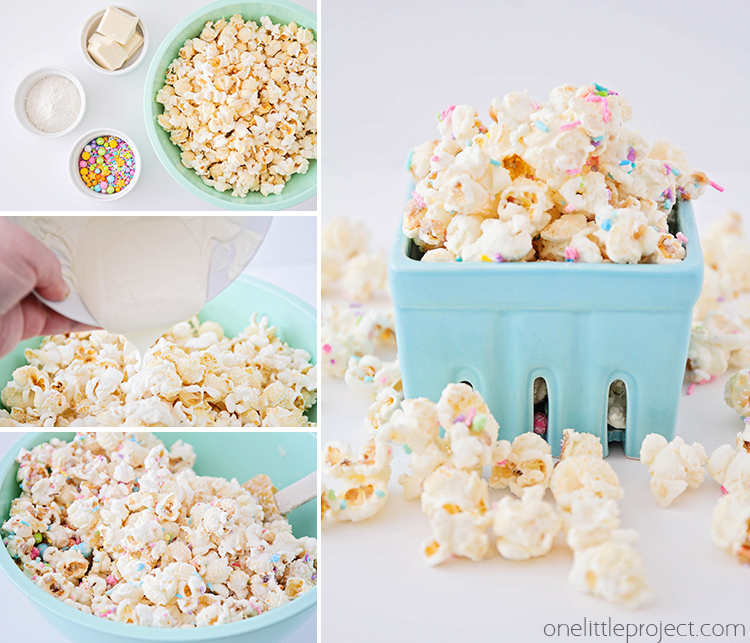 Sprinkle the cake mix and sprinkles over the popcorn, then toss to combine. 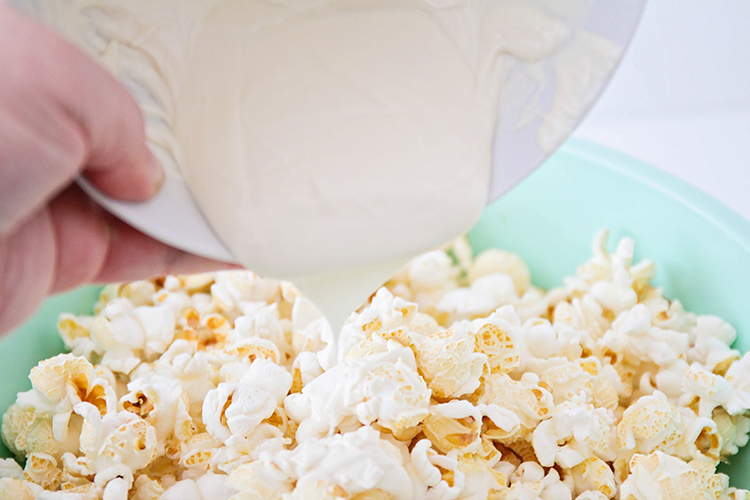 Spread the popcorn out on a baking sheet to cool and harden. 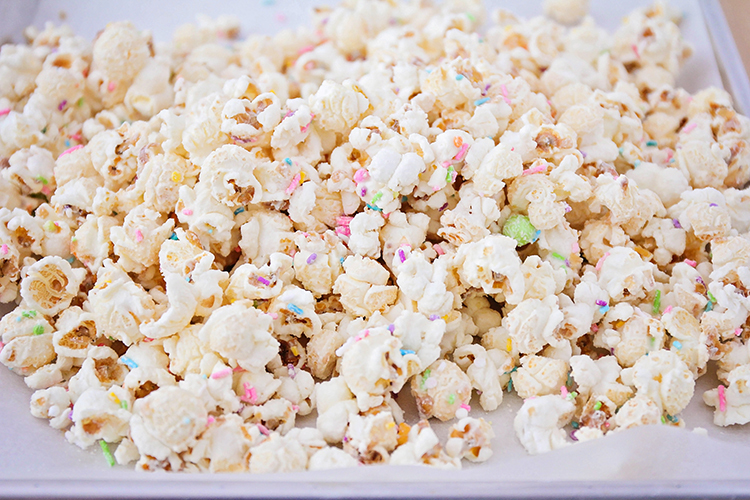 This delicious and fun birthday cake popcorn has only four ingredients, and has a sweet birthday cake flavor. 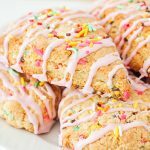 It’s the perfect treat for celebrating birthdays, or just for snacking!